French Interior Minister Christophe Castaner said Saturday that violent outbreaks in Paris were "under control" despite ongoing disorderly acts he declared "totally unacceptable." French police supported by armored vehicles fired tear gas at yellow-vested protesters on the Champs-Elysees. 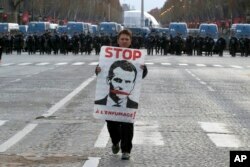 The demonstrators were protesting France's high cost of living. Castaner estimated 10,000 demonstrators had taken to Parisian streets and were among 125,000 protesters throughout the country. He said nearly 1,000 had been arrested in Paris and that 135 people had been injured, including 17 police officers. Bracing for a fourth week of violent protests, France closed the Eiffel Tower and other tourist landmarks and mobilized tens of thousands of security officers. Many shops in Paris were boarded up before Saturday's planned protests to avoid being smashed or looted, and police cordoned off many of the city's broad boulevards. Despite what Castaner said were "exceptional" security measures, protesters still smashed store windows and clashed with police. More than 89,000 police were being deployed nationwide, an increase from 65,000 last weekend, when protests over rising taxes turned into a riot that left more than 130 people injured. A demonstrator holds a portrait of France's President Emmanuel Macron during a protest on Paris' famed Champs-Elysees Avenue, France, Saturday, Dec. 8, 2018. 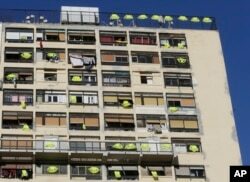 Yellow vests hang on the rooftop and at windows of an apartment building, Dec. 7, 2018, in Marseille, southern France. U.S. President Donald Trump tweeted Saturday that the Paris Agreement, a global effort to reduce global warming beginning in 2020, "isn't working out so well for Paris" and that "People do not want to pay large sums of money ... in order to protect the environment." Demonstrators run away during clashes Saturday, Dec. 8, 2018 in Paris. 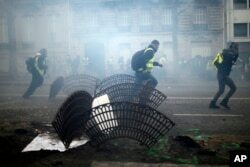 Crowds of yellow-vested protesters angry at President Emmanuel Macron and France's high taxes tried to converge on the presidential palace Saturday, some scuffling with police firing tear gas, amid exceptional security measures aimed at preventing a repeat of last week's rioting. Government officials are concerned that a repeat of last week's violence would weaken the economy and raise doubts about the government's survival. Wayne Lee and Fern Robinson contributed to this report.